How Does A Lease With Option To Purchase Agreement Work? 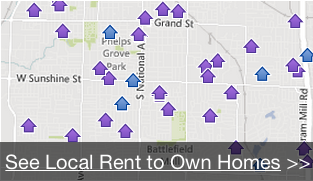 We’ll send you local Minneapolis - St. Paul rent to own / lease option homes that fit your criteria. Your lease/option agreement (also known as the rent to own contract) will spell out the length of time that you have to complete the purchase of the property – typically 1-3 years, but in certain circumstances we may extend your option if you need more time to get your credit or downpayment up to the point where you can qualify for a bank loan. First step – sign up to find great properties around Minneapolis - St. Paul just by filling out the form on the upper right of this page.